Moran’s is diving headfirst into a packed fourth quarter; a full lineup of auctions have been scheduled from October through the end of the year, and things are in full swing. Following their flagship California and American Fine Art and Women in Art auctions on October 23rd, Moran’s will present two Modern and Contemporary-focused sales on November 13th; a Prints & Multiples auction followed directly by their 20th Century Art & Design auction, which comprises 229 lots of fine art, furniture, and decorative objects. Furniture highlights from the 20th Century sale include two lots by master woodworker Sam Maloof (1916-2009 Alta Loma, CA). 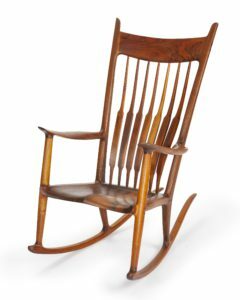 One of the maker’s iconic spindle-back rocking chairs will head to the block with a $15,000 to $25,000 auction estimate. A less common example by the maker, a game table accompanied by four low-back armchairs, hails from the Estate of California artist Millard Sheets, and has been assigned a $15,000 to $20,000 estimate. An ever-popular Eames/Herman Miller lounge chair and ottoman (models 670 and 671 respectively) featuring black leather upholstery and rosewood shells have been valued at $1500/2500. A malachite-veneered brass coffee table by celebrated New York metalworking house P.E. Guerin will surely find a number of interested bidders; the piece is conservatively estimated to bring between $5000 and $7000. For those with a competitive streak and a little extra space in their homes, a regulation-size pint pong table customized with a giclee print of Andy Warhol’s (1928-1987 New York, NY) “Missile Map” on the top will make a fun buy (estimate: $1000 to $2000). Works by European artists will be featured earlier in the catalogue; modernist Françoise Gilot’s (b. 1921 French) pencil drawing “Iris, I” will head to the auction block with a $5000/7000 estimate. 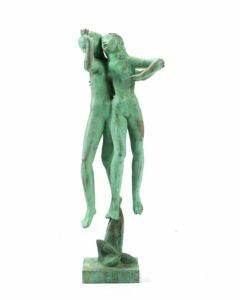 Swedish/American sculptor Carl Milles (1875-1955) is represented in the catalogue with a charming bronze sculpture of two women titled “Systrarna [Sisters]” (estimate: $10,000 to $15,000). An abstract still life executed in a palette dominated by cool and neutral hues by French painter Claude Vénard (1913-1999) will head to the block with a $5000 to $7000 estimate. Contemporary Chinese artists Fong Chung-Ray (b. 1934) and Wei Jia (b. 1975) are each represented with large-scale abstract compositions in Moran’s November 20th Century catalogue. Fong Chung-Ray, who has lived in Taiwan for much of his life, is featured in the catalogue with two acrylic paintings, each dating to the 1980s. The ethereal compositions are each offered with a $15,000 to $25,000 auction estimate (titles: “89-32” and “84-3”). 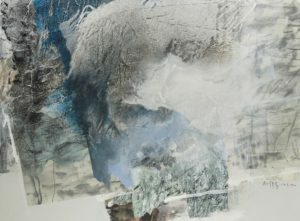 A mixed media composition by Wei Jia from his Calligraphy Series is based on the work of Yan Zhen-Qing; titled “Chinese Calligraphers Series #46” has been assigned a $2500 to $3500 estimate. Works by American artists include pieces in a wide range of styles and subjects. Robert Vickrey’s (1926-2011 Naples, FL) intriguing painting of a trio of nuns walking by a wall mural with colorful balloons has been assigned a $6000 to $8000 estimate. Enoch Bolles (1883-1976 NJ/NY), who created hundreds of pin-up girl illustrations for magazines, is featured in Moran’s 20th Century Art + Design catalogue with a moody composition featuring a pin-up girl curled up with a cigarette against a black background (estimate: $12,000/18,000). Russian-born painter Grigory Gluckmann (1898-1973 Los Angeles, CA), known for his rich palette and the depth of his compositions, often painted dancers and female subjects with a soft touch. The November catalogue features a work by the titled “Before the Mirror,” depicting a seated ballerina preparing for a performance – Gluckmann has positioned his subject facing away from the viewer, not an uncommon choice for the artist (estimate: $12,000 to $18,000). Gustavo Montoya’s (1905-2003 Mexican) “Girl in a Pink Dress”, which is slated to head to the block with a $6000 to $8000 estimate. 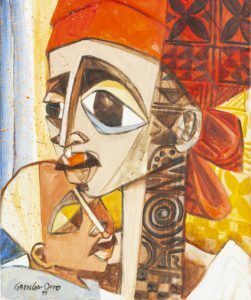 “Bonding,” an abstract portrait of a mother and child by Nigerian artist Gbenga Offo (b. 1957) (estimate: $3000 to $5000). 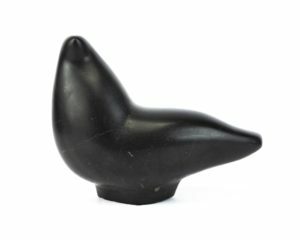 Bolivian sculptor Marina Núñez Del Prado’s (1910-1995) carved and polished stone sculpture, aptly titled “Bird,” which has been assigned a $10,000 to $15,000 estimate. The 20th Century Art + Design auction is scheduled for Tuesday, November 13th at 2pm. The Prints & Multiples auction will begin at 12pm. Catalogues are available for pre-order now; contact John Moran Auctioneers directly to order your copy. John Moran Auctioneers will follow their November sessions with four auctions over two days scheduled for December. On Tuesday, December 11th, Moran’s will host four auctions: Fine Jewelry, Studio Jewelry, Rare and Important Watches from a Private Collection, and Luxury Accessories. On Wednesday, December 12th, Moran’s will host an Art of the American West auction. For upcoming highlights and more information on these sales, visit Moran’s website: www.johnmoran.com.